QUINCY, Mass. In the middle of Sunday’s historic October N’oreaster, a beach walker on Martha’s Vineyard found a cold-stunned Kemp’s ridley sea turtle, the most endangered sea turtle species in the world. The 5-pound juvenile, with a black and green shell and a serrated edge, was found just before noon near a tidal pond in Edgartown. The turtle had an in-take temperature of 52.5 degrees Fahrenheit. The turtle was taken off island immediately and brought to the Massachusetts Audubon Sanctuary at Wellfleet Bay, which late each autumn acts as the frontline center for gathering hypothermic sea turtles from around Cape Cod and the islands. This annual event occurs each November and lasts through December. Last year more than 120 endangered and threatened sea turtles were brought to the New England Aquarium’s new Marine Animal Care Center in Quincy. Despite the exceptional stormy weather, this turtle was right on time. Aquarium staff often comment that you can set your ancient timepiece within a couple days of November 1 with the arrival of the first cold stunned turtles. This little guy officially stranded October 30 and was brought to the Aquarium’s off-site, state of the art rescue facility on Halloween, October 31. The turtle had an intake temperature of 52.5 degrees Fahrenheit – a true zombie-like state! Sea turtles are reptiles, which makes them cold-blooded and tough. Unlike warm-blooded animals, they do not need to maintain a constant body temperature. Cold-blooded animals will assume the environmental temperature around them, or in this case the ocean temperature. The water off the Vineyard likely took a significant rapid downturn with the storm turning the water over quickly and cooling it. Volunteer Carrie Thistle is supervising the Kemp’s ridley during a short swim in a baby pool swim that acts as progressive physical therapy. This turtle should have begun migrating south in September, but something kept it from doing so. Most often, young cold-stunned sea turtles cannot figure the difficult navigation to get out of Cape Cod Bay, which is bounded on three sides by land. But this turtle was found on the Vineyard, which is on the swim route south. In their initial physical work-up, Aquarium veterinarians and biologists found that the turtle might have had some underlying medical issues. It was moderately thin and had lameness in its right front flipper from an apparent old orthopedic injury in the elbow there. The turtle will be slowly re-warmed a few degrees each day until its body temperature is in the low 70s. Beyond life-threatening hypothermia, nearly all of the sea turtles that come in also suffer from dehydration, malnutrition and metabolic problems. About half of these cold-stunned creatures will also have pneumonia. Orthopedic problems and infections are also common. Rehab will take anywhere from a few to 10 months. 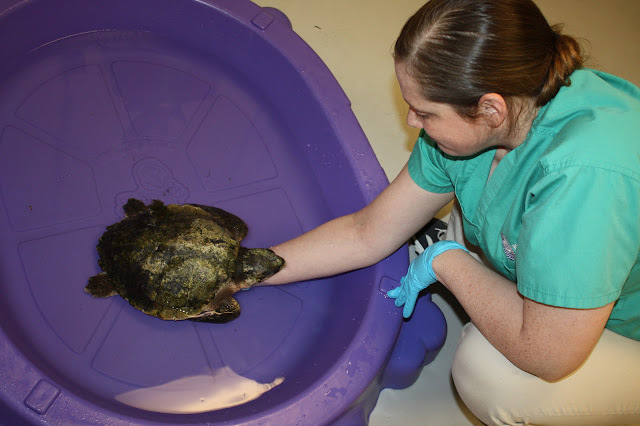 Once a turtle is healthy, it will be transported for release. In late winter, the warm water is in Florida or Georgia. In August, the release site can be in the waters south of Massachusetts. Over the last 20 years, the New England Aquarium has rehabilitated and released over 800 Kemp’s ridleys. There are only a few tens of thousands of this species alive today. The Aquarium funds the great bulk of this significant expense through its own monies and private donations. The prognosis for this animal is guarded but optimistic. Once Aquarium staff are confident in its recovery, they will give it a name. Each year, rescue biologists choose a theme from which to choose names. In the recent past, constellations and national parks have been among the themes. This year, it is superheroes and villains. 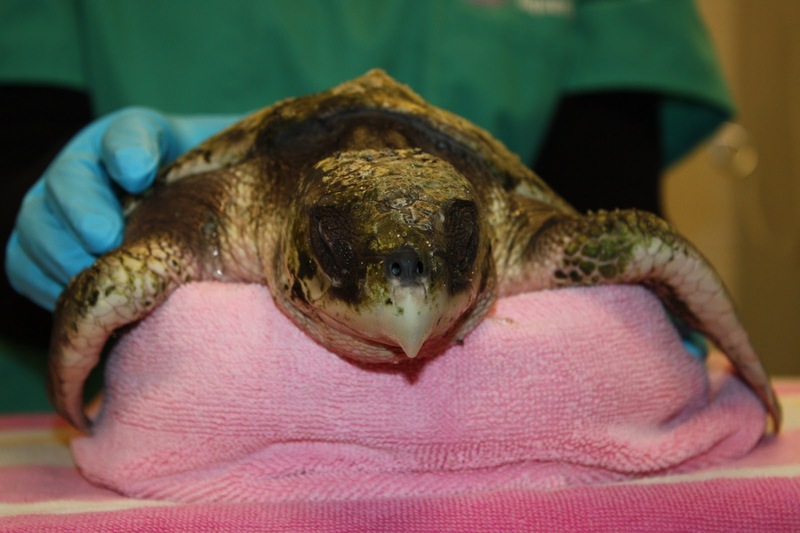 Follow the rescue effort all month on the Aquarium's Rescue Blog.